Did I Break My Lap-Band? Back to that time when I seriously thought that I had broke my Lap-Band. I had been cruising along for over a year with 7.3 ccs in my Lap-Band. Just not in huge quantities. My hunger was under control. Food would get stuck or "PB" (food coming back up) maybe once every 2 or 3 months. Then my food choices got STUPID over the holidays: Cookies, cake, treats, etc. Then came new years day 2015. My honey and I went on a weekend getaway to San Francisco: Ice skating, Shopping, Theater Shows, Food, etc! 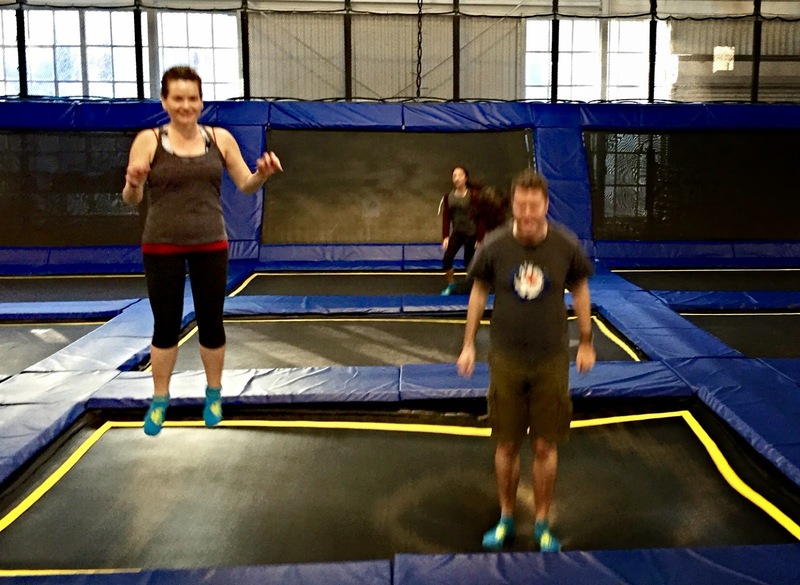 Jan 1 -- We started the weekend by going to the Trampoline park in SF. We jumped and jumped and jumped. Great exercise and so fun! Nifty socks included. Jan 2 -- Major PB lunch. Again a bad PB at Dinner. Bad food choices by me. Liquids going down fine though. There was a constant middle of my back pain and the really bad heartburn began. This was such a NEW experience for me. My Lap-Band had never caused me such pain. My constant thought: Did I break my Lap-Band by jumping on the trampolines? Seriously. WTF. Jan 3 --Our fun weekend was over and we headed home. I called my surgeon for an emergency unfill that week. Jan 5 -- Major unfill of my Lap-Band at bariatric surgeon's office: 3.5 ccs! Now there was less fill in my band than when my band was put in at surgery in October 2009. Jan 5 onwards - heartburn and some pain with most all food choices. Liquids going down fine. Jan 21 -- Barium swallow. The barium swallow doctor and the tech assistant guy in the room kept saying "Looks good" and "be careful, you'll gain weight with a band that loose" They even had me swallow a barium pill (HUGE PILL!) And that pill went down no problem. Jan 28 -- Appointment with Bariatric surgeon for the official verdict on the barium swallow. He said it looked OK. I did not want a fill. He didn't want to do a fill. Still having slight pain and some heartburn occasionally. He said some scary words to me: "You don't want to lose your band" and we ended the appointment with "Let's see how it goes at this fill level". March 5 -- The last time I had heartburn. March 5 onwards -- No pain when eating. No heartburn for awhile now. Uh oh! I can now eat more. I am getting hungry after about 2 hours with my usual small portions. The scale is going up. I'm HUNGRY! Called bariatric surgeon for fill appointment. March 26 -- Appointment with bariatric surgeon. 1.5 cc fill. March 26 onwards -- Hunger is GONE. Scale has gone down a few pounds. Still no pain. Still no heartburn. So here we are: April 4. Today. I can't take my band for granted. I need to make good food choices. If and when my Lap-Band is removed (a silicone device has a limited lifespan) I hope the good folks over at Apollo Endosurgery are still manufacturing Lap-Bands so I can get a band replacement. I don't think I could ever revise to a bypass or sleeve. Not my thing. And NO, I didn't jump my band broken. I remember during my fill appointment with my bariatric surgeon on March 26. I joked with him when laying back on the table and said "Look! I'm winning today. I don't have to undo my pants for the fill. These pants are loose!" He then smiled calmly down at me and replied with,"You've already won."